"An Octopus took my camera from me", says Amee Penso, one of the guides on the OC Wildlife & Beach Tours. 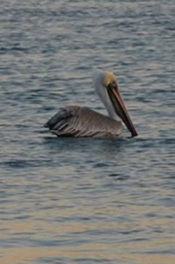 "We've laughed for days over this one", says Cheri Ikerd, President of OC Wildlife & Beach Tour. To be able to see different wildlife and marine life several days a week is an adventure and truly an amazing experience in Orange County. There are new animals each and every time on tour and no one ever knows what will be seen as it is a surprise all the time.it's wildlife. "There's always some oohs and ahhh's and some laughter along the way", says Ikerd. There have been some amazing wildlife sightings. "In broad daylight a Bobcat walked right in front of us and took an American Wigeon to feed herself, says Ikerd. There's been seagulls eating sea stars and sea urchins and it is funny to see a seagull with a sea star sticking out of its neck". A six legged Sea Star has been also been spotted several times at the tidepools in Laguna Beach; Sea Stars only have 5 legs. "Northern Harriers, Ospreys and Great Blue Herons have flown over us in Huntington Beach and Newport Beach. And, Black Oyster Catchers have eaten a few yards in front of us. There's been sea lions and dolphins playing at this cove in Laguna Beach we go to and we've seen Gray Whales passing in the winter time many times. And, of course, the latest and wildest, was when an Octopus took a camera from one of our guides. The Octopus, named Gollum after the Character in Lord of the Rings, even took a photo of himself! She was able to retrieve her camera, but it wasn't an easy task, and something we have laughed about for days and days". Guests know they will see plenty of wildlife on the tours, but Life is like a box of chocolates.you never know what you're gonna get or see.so guests should be ready to be surprised at anytime. A lot of locals come on the tours (people from Los Angeles, Orange County, Riverside, etc.) and have no idea the amount of wildlife and marine life Orange County has and it's so close to come and enjoy a fun half day while learning at the same time. People also come from all over the world to see the tidepools and a seal or sea lion because other parts of the world don't have this. Orange County is just a hidden gem with the most amazing wildlife and a beautiful coastline of 42 miles. Article submitted by OC Wildlife & Beach Tour.